In case anyone wondered if things could get any worse, they could. Time for desperate measures. Last update of the year! I hope you are all having a nice holiday break! 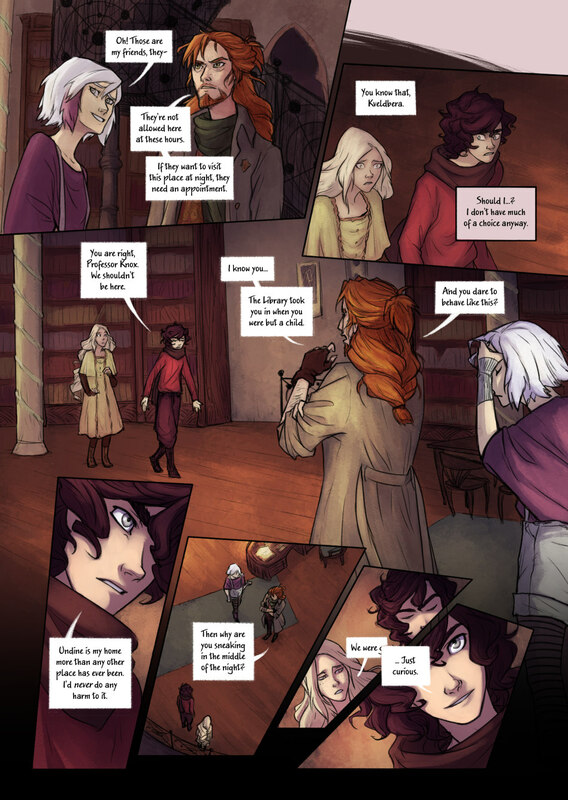 I’ve started designing the printed edition of Bookwyrms and I couldn’t be more excited. I wish you all a brilliant 2018! Will I get the year right in the next update? We shall see! The word bubble over the eye is a suuuuper sweet touch! Still can’t get over the hair. Has a memo about his ‘talent’ been sent in every service of Undine already? What are the others going to think if it works and the Professor just, “believes” him? Will they doubt his intelligence? Because I would. I love the way you framed Rogier in the bottom right corner, and the way you cover up speech bubbles to indicate interruption rather than using the standard “We were–“. Also, where did you first get the idea for Rogier’s locks? They’re always very striking. About Rogier’s locks, looking back to my old drawings I can see a tendency of trying to draw characters with locks, it’s something I like a lot visually but to be honest I haven’t found many examples of characters to draw inspiration from, particularly with Rogier’s hair length. I remember finding something similar in Viria’s design of a Percy Jackson character named Leo, but they still weren’t proper locks like the ones I needed for Rogier. His hair was by far the aspect of any character that took the longest time to design and get right. I’m happy it paid off! Rogier is doing the thing!! He looks awesome in the last panel.